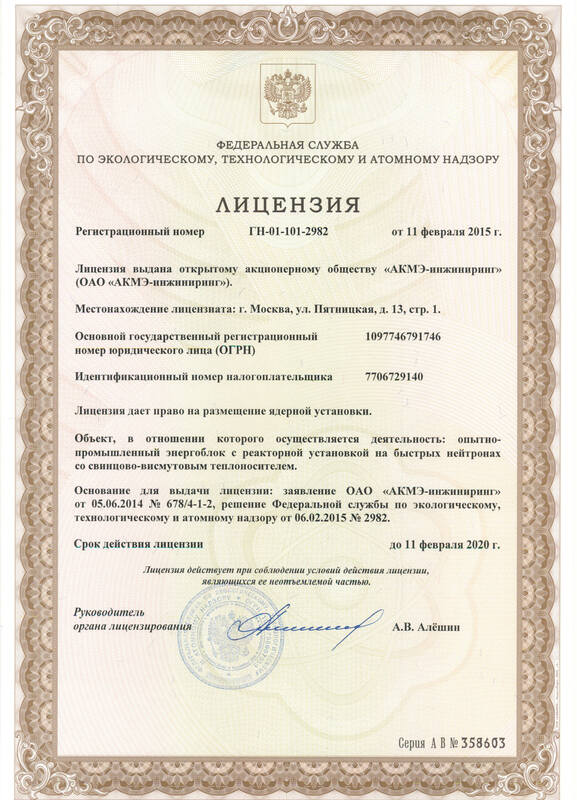 On February 11, 2015 JSC "AKME-engineering" obtained the license giving the right of a placement a nuclear power plant facility - pilot unit with 100 MW lead-bismuth coolant fast reactors SVBR-100 in the Ulyanovsk region (Dimitrovgrad). Obtaining a license for the placement of the pilot unit SVBR-100 is an important milestone in the creation of the nuclear power plant. It means that ROSTEHNADZOR agrees in general for the location of the pilot unit and from this moment starts next stage of design and preparation for construction. Further step in the approval route is obtaining license for the construction of the nuclear power plant.